New curb and concrete island construction on Milwaukee Ave. between Erie and Sangamon. 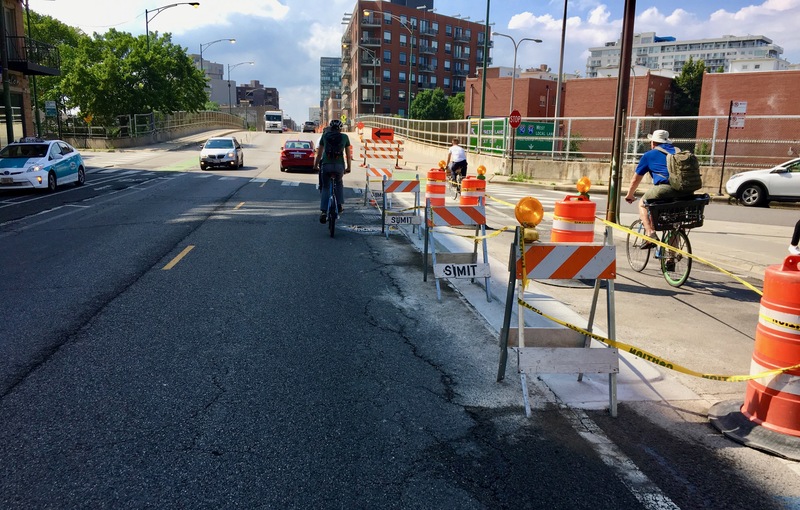 Crews are in the end of week two of two in constructing new curbs on the northbound side of Milwaukee Avenue to separate bikes and cars. 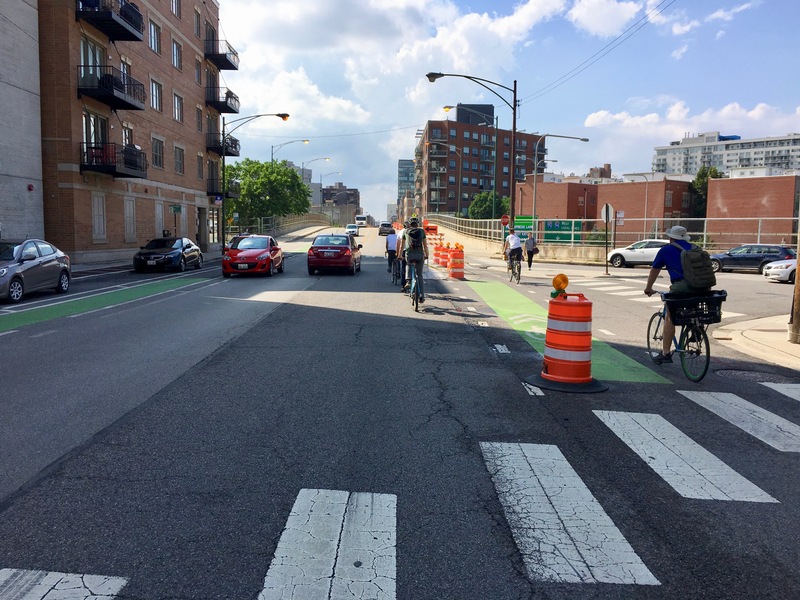 The project to enhance the existing protected bike lane on this side of the street was announced last Wednesday and constructed started immediately. Construction is supposed to last two weeks in each direction. 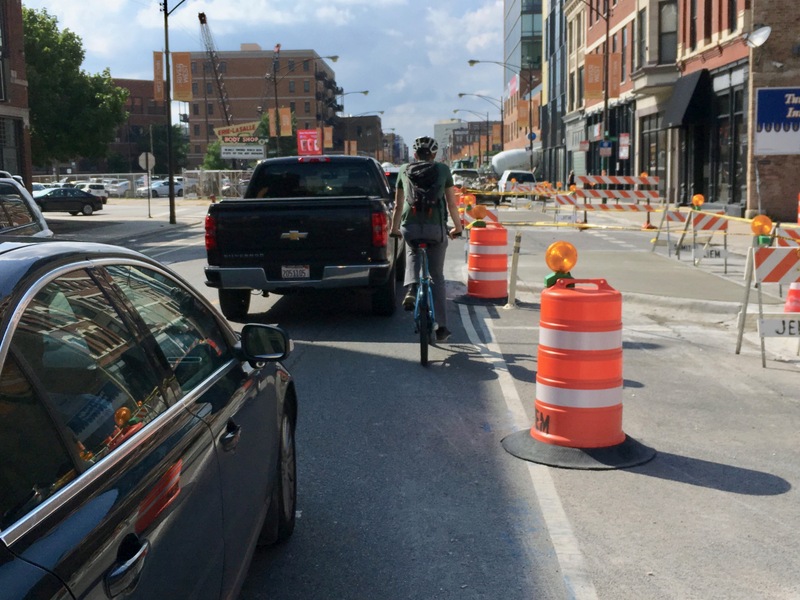 A person rides a Divvy bike north on Milwaukee Avenue and squeezes between cars and orange traffic barrels. It doesn’t feel much different than riding through Wicker Park. 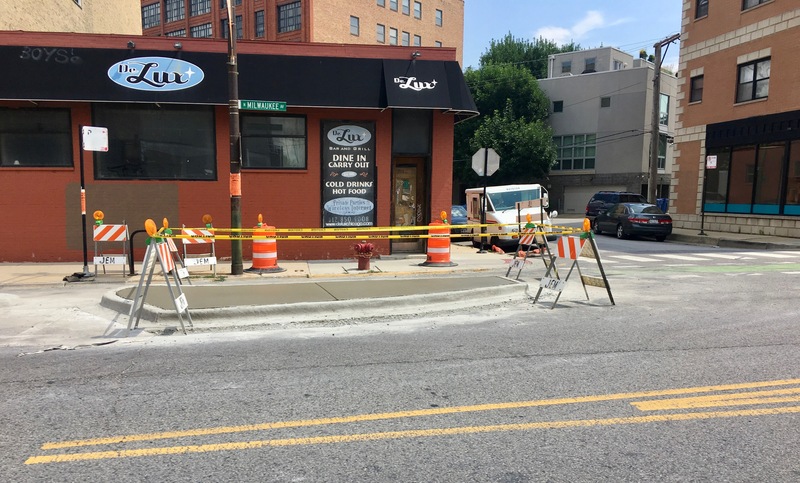 New concrete curbs are being poured between the row of parked cars and the bike lane, while concrete islands are being placed in the clear zones the separate parking lanes from driveways. Motorists tend to park in the clear zones while waiting to pick up or drop off, and block views of oncoming bicyclists. This is one of the clear zones at driveways and intersections that ensures a lot of visibility of bicyclists to turning motorists. However, these areas are usually delineated with paint and plastic posts, the effectiveness of which is nil. Parts of the curbs in some areas appear ineffective, given that they’re an inch or two tall. Additionally, at some of the most dangerous parts of the street, at Erie and at Green/Ohio, there will be no new infrastructure to slow down drivers or close off certain turns that drivers sometimes speed into. A low curb at Carpenter St allows motorists to make wide fast turns. An alternative could be to have the curb the same height and to ban the 270 degree turn from southbound Carpenter to northbound Milwaukee. It’s common for motorists on Carpenter to drive past the stop bar and nose into the bike lane as people are cycling. There is no detour, so bicyclists and motorists are required to shared a single, standard width lane. But if you ride north on Milwaukee to at least Leavitt Street, then it feels pretty much like the stretch of the street through the Wicker Park “Death Star trench”. There is a low curb on this part of the infrastructure project, between Green (behind the photo on the right) and Ohio (on the right). Next week, presumably on Wednesday, crews from the Sumit construction company will work on installing similar infrastructure on the southbound protected and buffered bike lanes. Motorists coming from the north on Green Street (which is a north-south street, and marks the beginning of the northbound side of the project) often make a dash across the bike lanes and travel lanes of Milwaukee, putting bicyclists and other motorists at risk. This is good but why not do a lot more linear length even faster with the precast curbs gaining popularity? Even better than pre-cast curbing which is brittle, expensive, heavy, interferes with debris clearance and storm water drainage and is difficult to modify is a product like the DezignLine Bikerail, manufactured by Dero Bike Racks (https://www.dero.com/product/bikerail/). Bikerail provides real separation between cars and bikes, is fully modular, and can be adjusted on the fly or reconfigured later, has a 2″ gap between the rail and the street to allow for debris clearance and storm water drainage, and is considerably cheaper than pouring concrete. Bikeraail can be installed at roughly 250′ per hr. Chicago to Ohio is roughly 2230’ so for example both North and South bound lanes of that section could be completed with Bikerail in as little as 18 hours! This installation in Colorado Springs was 1400 linear feet and took the crew 5.5 hours. Compared with Milwaukee which is expected to be under construction creating the not-great conditions in the article above for at least a month. Which cities have installed pre-cast concrete curbs and had a bad time with it? Evanston has seen a lot of their precast curb separation cracking and the curbs at the end of runs have had to have a taper retroactively ground on the ends. As Evanston removes their separation for winter and reinstall it in the spring, the curbs don’t hold up well to all the moving and transport. Disclosing that this is your company’s product would be good form. Our website is part of my profile, but sure, I am the regional rep for Dero and I can be reached at jason@dero.com. I work for them because I believe in what we do and that this product can save lives and money. Unfortunately, most people don’t go beyond the comment. I would love to see the City do some more pilots with different treatments to see how they hold up. Precast, planters, your product, etc. I think there is strong movement in the direction of innovative solutions. Remember that only a few years ago bollards, bicycle dedicated signals and parking separation were new ideas here but Chicago and other cities in the region adopted them. We’ve just become accustomed to them. The improvements along Milwaukee from Belmont to Ashland have used new techniques like closing off slip lanes and planters have been installed, I think maybe by the SSA. That’s the other part is engaging other partners like chambers of commerce and neighborhood groups to support and compliment what the city is doing. I’m confident we’ll continue to see innovative solutions. You never know what city planners are working on until the announce it. Stuff is always in the works we don’t know about. Interesting, I didn’t know that concrete was that bad for the environment. I know it can be recycled to some degree from LEED courses I’ve taken but the recycling process is a pretty resource intensive process itself. I’d support this sort of system for the simple fact that it can be pulled up in winter, and you can avoid having to use specialty equipment to plow the PBLs. Lake Street was horrible in the winter because it was pretty clear the specialty equipment couldn’t keep up (or wasn’t even deployed), though now the alternative is essentially no “protection” since they removed the bollards on the entire stretch (which has increased car traffic in the bike lane). That said, these seem pretty close to the traditional plastic bollards PBLs used (with I imagine some extra longevity benefits) in the past, and it seems that sort of division method has fallen out of favor pretty hard (which honestly I’ve never understood as a car can hop a curb just as easy as it can take out a plastic bollard, but it is what it is). Do these actually provide any added protection over plastic bollards to help those concerns? Evanston removed the separation for the winter? I don’t really remember seeing that happen. The Bikerail system is a bigstep beyond bollards. The rail itself is 1/8″ walled steel tubing, 4″ x 6″ and sits about 8″ high off the ground, so as high or higher than most curbs. The bollards are just an option that can be added at east pivot post to increase visibility. it’s my understanding that various portions of the their protected network both bollard and physical separation are removed and/or re positioned during the winter to allow for snow plowing etc. and due to reduced usage. The decision between precast curbs is somewhat driven by labor conditions. Slip formed curbs require a few skilled equipment operators, but not much other labor. Precast curbs require more labor, but it’s less skilled. The main advantages of precast curbs are that small sections can easily be pulled up, making small design changes easier, and the curb segments can be dyed allowing for more permanent markings than paint. Concrete has two factors that make it a major carbon emitter. The first is the massive amount of heat that cement kilns require. Most of that heat comes from burning fossil fuels. The second factor is the basic chemistry of cement. The chemical equation for turning limestone into cement has carbon dioxide as a byproduct. Concrete can be down cycled, but not fully recycled as new concrete. Recycled concrete is commonly used in place of crushed limestone as aggregate base under pavement. One of the biggest considerations is also storm water drainage. If curbing, precast or poured in place, creates a need for new sewer drains because it diverts storm water away from existing drains the project can get very expensive very quickly. > Parts of the curbs in some areas appear ineffective, given that they’re an inch or two tall. Based on the picture, it looks like it’s more aimed at providing trucks the ability to make the turns as most cars are going to get a good jolt if they cut across it (at speed). I know plants need to be pretty local because wet concrete has a short life-span, but I would guess the trucks, including the fact that even ones waiting to pour have to be turning, would be a major source too. No it doesn’t. 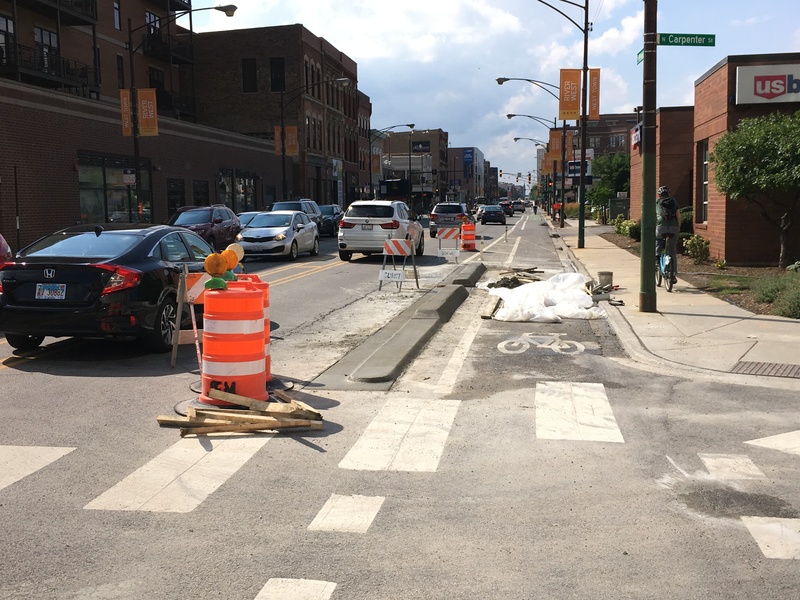 There are small gaps every so often to allow drainage on the Clybourn curb-protected lanes. You’re right that there are gaps along that stretch to try to accommodate storm water drainage, but they can become overwhelmed by heavy rainfall. Those gaps are designed to allow water to move water to move off the roadway and to the sewer drains, but they’re not designed to keep the bike lane clear of water. Also as the road surface moves due to frost heaves, etc, it can create low spots that trap water within the bike lane. This is especially problematic during fall and early spring when puddles freeze over. A continuous gap allows for better drainage in both directions and debris clears out more easily as well. The massive amount of bike traffic on Milwaukee nowadays suggests that the extra protection was warranted.